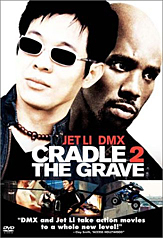 Choose "Special Features" and press the Right arrow, to highlight Jet Li's knee pad. Press ok, or enter, to see this egg. Choose "Additional "Special Features", from the "Special Features" menu, and hit Ok, or your Enter button. From the next menu, press the Right arrow, to highlight Gabrielle Union's necklace.